Blogging is an interesting activity that can help you reach and connect with a huge number of readers and audience. Making the blog visible to the potential readers is a challenging task and it requires a lot of search engine optimization and strategy to reach the visibility that it needs. But, the biggest mistake that a blogger can make is not getting the readers to subscribe to their page. It is a kind of wasted effort when the readers you have worked hard to bring to your site do not return and they miss the next posts that you make. A sure shot way to ensure that you remain connected to the readers and they return to your site with every new offering. If your blog is a good one it will always make sure that the readers stay updated and they are always aware of what is happening in your blog. If you have a newsletter, your readers can always stay posted about the latest updates and developments. These newsletters are a medium in which the subscribed readers can stay updated all the time. · Automated Email Newsletters: In this kind, the blog posts are directly sent to the subscriber’s inbox and you do not have to make any additions. This needs to use the RSS feature that comes with the blog. There is the free Feedburner option that can be opted for, or there is Aweber that can be subscribed at just $1. They will convert the RSS feed into an email newsletter that will help you get more subscribers. · Manual Newsletters: Here the RSS does not create the newsletter automatically; rather it uses only certain articles that you choose to send to your readers. With the help of this you will have more control on what your readers get to read and what you share with them. This can help the professionals bloggers serve their readers better and earn their trust. 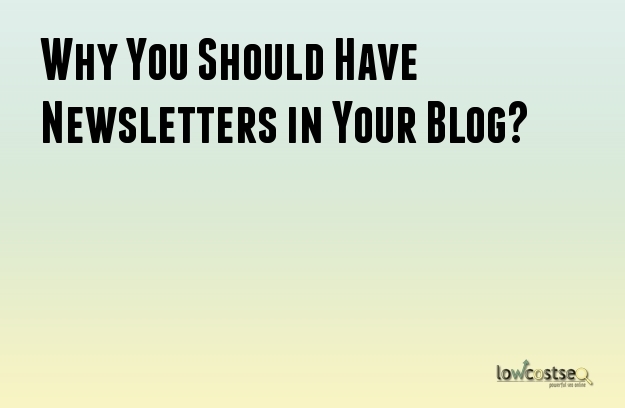 The newsletter has many advantages and can be very useful for the bloggers and the blog. · Keeping The Readers Updated: Newsletters are the best way to inform them of your latest activities. · Revisiting: If the readers like your blog they will subscribe to it and revisit it later for more. · Increase Reader Interaction: With this you can interact more with your readers and create a bond with them. They will also give you feedback regarding you blog that will be very beneficial for you. · Monetization: They will also attract a lot of advertisers.